Is it better to use self-hosted or cloud version of ActiveCollab? They both have the same features so the decision depends on the structure of your company. Self-hosting is great if you plan on using ActiveCollab for more than a year and/or have a lot of team members. If on the other hand you don't want to worry about IT systems, have a small team, and just want to use the app without making a big commitment, cloud is for you. Self-hosting is when you install and access software from your own server. Most web apps you use (like Google Docs and Gmail) are run on some server (eg. Google's); when you want to use those apps, the server runs the app and then you can access it in your browser. Because ActiveCollab is a web app, to self-host ActiveCollab you'll need a server, domain name (URL from which you'll access ActiveCollab in your browser), someone to install ActiveCollab on the server, and pay hosting fees to your internet service provider every month (just like you do when you have a website). You can read more about self-hosting here. The alternative to self-hosting is to use our cloud where you don't have to worry about anything - you just go to activecollab.com and log-in. The cloud is perfect for small teams that don’t have the resources to deal with system administration. You simply enjoy ActiveCollab as you go, there’s no overhead costs, and you never have to worry about maintenance. 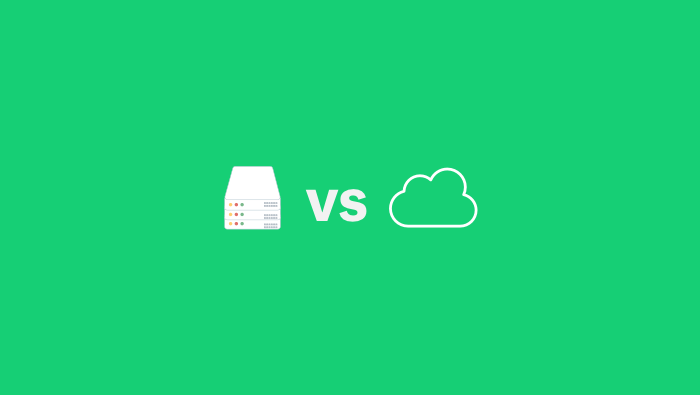 Smaller businesses with a limited budget often choose the cloud. This way, they're sharing maintenance and development costs that would be much higher than if they chose to self-host ActiveCollab alone. 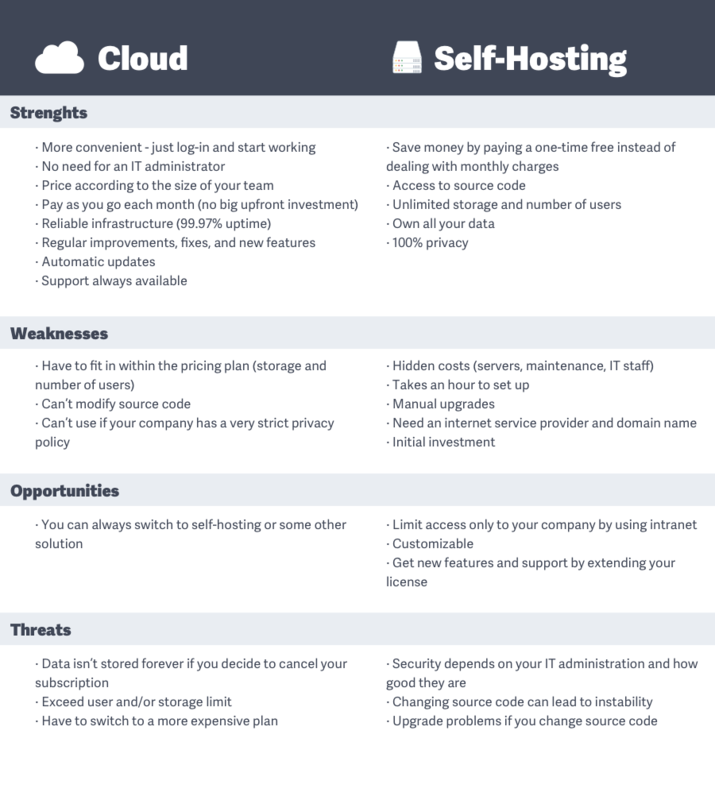 There are 5 main criteria you have to take into the account when deciding on whether you should choose cloud or self-hosting: data security, maintenance, storage, number of users, and cost. Cloud: With cloud-based apps, security is top priority for the service provider. By choosing the right company, with good recommendations, you can be sure that a team of experts will take care of your sensitive business data. Cloud service providers do their best to keep data safe and secure as their business depends on it. This way, users who just wish to log-in and start working don't have to worry about data integrity and security. Self-hosted: Self-hosted solutions are placed on your own servers, where you are in control. You are in charge of setup, bandwidth, storage, and level of security. This is important for companies who have very strict data exposure and storage policies; such rules narrow down their choices regarding management tools to either using an in-house project management tool or ActiveCollab. Cloud: By choosing cloud, you may not even notice when there's an update. You are always using the latest and the most stable version. If you are not tech savvy, or if you don't have enough time to take care of the system, the cloud version is the right choice for you. Self-hosted: With a self-hosted application, you are the one who needs to do the update every time there's a new version and stay informed about the release cycle. Some people don't like to do the upgrade themselves due to the potential issues that can arise. Even if our tech support team is here to help out, upgrades can sometimes cause frustration. Storage is a special concern for people in the creative field. Companies who do design, media production, and architecture are often working with a large number of files (sometimes up to 1GB per file), so storage is a big concern. Cloud: Cloud services are limited in storage size. But, if you're not working with a lot of massive files, our cloud subscription will meet your demands just fine. Some systems even offer the possibility to get more space on demand, or reward users with additional space. A lot of people asked us if they can upgrade their storage in case they need more space one day, but in 97% of the time they never actually needed to. Self-hosted: Self-hosted has no file number or size limit. In fact, our tech support often comes across setups with huge data sets (tens or even hundreds of gigabytes in some cases). So, if you're in need of a lot of storage, choosing the self-hosted version may be the wisest choice. Cloud: Cloud pricing plans limit the number of users you can invite. If you work with a small team, this is not an obstacle. Some project management tools make a distinction between user roles (eg. team members, clients, owners) and offer different pricing (or even the option to include a certain group of users for free). This way, you can increase the number of users as your team grows. ActiveCollab's pricing plan depends on the number of team members, but you can have an unlimited number of clients. Self-hosted: In self-hosted, you can invite as many people as you want. The option to bring everyone on board is great for big companies who want to centralize all their work across departments. Users with diverse teams and a lot of sub-contractors value this option the most. Cloud: For the cloud-based versions, you pay a monthly subscription tailored to your current needs, which you can cancel at any time. Small and medium size businesses usually go with such a solution. The plans are relatively flexible and you can switch to other plans as your business grows. Self-hosted: Here, you pay more money at the start (through a one-time fee) but start saving money as time goes on. Usually, this type of licensing is preferred by large organizations or companies who prefer to pay once and “own” the tool.